On the heels of President Obama’s announcement regarding new carbon emission standards at power plants, a new study reveals that Brazil is leading the world in the reduction of carbon emissions thanks to a massive decrease in deforestation. According to the study, farmers and ranchers in Brazil have refrained from so much clear-cutting of forest land during the past decade that over 33,000 square miles of rain forest have been saved. This means that more than 3.2 billion tons of carbon dioxide gas has been absorbed by plants and trees that were saved, instead of making its way into the atmosphere, while more than 80 percent of the Amazon has been preserved. Brazil leads all countries in decreased deforestation, but the nation is not alone. Statistics show that 10 percent of climate emissions currently derive from deforestation, a number that was 7 percent higher a couple of decades ago. Initiatives like Brazil’s and others in places like Mexico and Central Africa are responsible for the plunge in deforestation numbers. Remote sensing satellite technology has played a large part in Brazil’s success. Pictures from satellites can track where and when deforestation takes place, and this data has allowed the country to take action in the most needed areas. 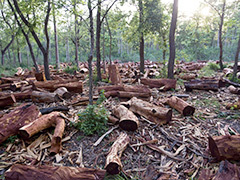 Stricter rules have also played a large part in the attack on deforestation. Large portions of the Amazon are required to be protected, while nonprofit organizations like Greenpeace have aided law enforcement by finding and publicizing rule breakers. Although the data shows that Brazil experienced a slight regression in 2013, the cause is unclear, and officials think extreme weather may be playing a part. The country is already formulating even more plans to prevent deforestation, including an incentive program that would reward farmers for preventing the emission of greenhouse gases. After experiencing their own version of a Green Movement, Brazil serves as a prime example of how planning, initiative, and action can truly help save the world by making it more environmentally cautious. Posted on June 11th under Global Ecology.